As a resident of Illinois and an Ameren customer, you have the ability to shop and switch to a lower electricity supply rate than what Ameren offers. Below you will find Ameren’s “Price to Compare” as well as competing rates available in your area. Switching is 100% free and can be done in just minutes. Though not quite as old as its largest competitor, Commonwealth Edison or ComEd, Ameren combined several of the Midwest’s elder utility companies to become one of the biggest investor-owned utilities in the country. While ComEd, servicing Illinois’ largest city of Chicago, covers a greater population, a far larger portion of the state receives its bills from Ameren. Ameren itself is a relatively young company, first incorporated in Missouri 1995 and becoming a major player in 1997 when the Union Electric Company in Missouri and the Central Illinois Public Service Company, which would become Illinois Rate Zone I, joined forces. The company then acquired the Central Illinois Light Company – Rate Zone II – in 2003 and Illinois Power Company – Rate Zone III – in 2004. Ameren operated in Illinois as three separate utilities before combining into one company with three rate zones in 2010. Both Union Electric and CIPS date back as far as 1902, though the other utilities were younger. Ameren Illinois Rate Zone I covers more than one-third of the state’s surface including nearly all of the southern three-quarters of the state’s eastern border to the southern tip and the west of the state west of Springfield and southwest of Peoria. Ameren Illinois Rate Zone II primarily covers the area immediately around Peoria southeast nearly to Decatur. 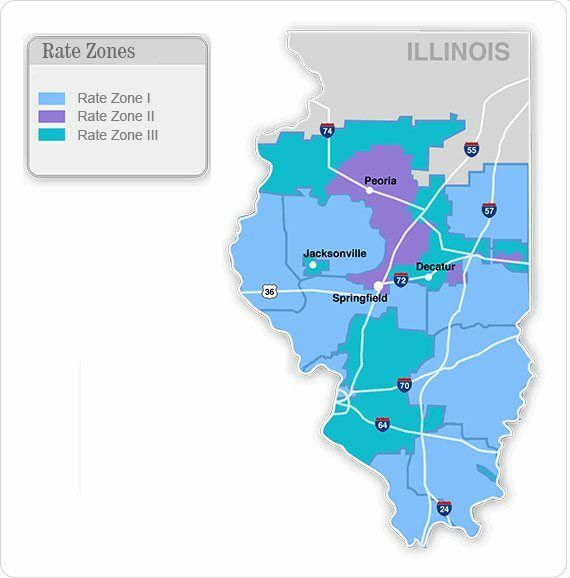 Ameren Illinois Rate Zone III fills in gaps between these two service areas in the southwestern corner of the state around Venice, from Decatur east to the border and to the south and east of Moline. With Illinois energy deregulation, Ameren customers have the right to choose their own electricity supplier. If the competition between these Illinois electricity suppliers is not taken advantage of, Ameren will give that customer a default supply rate. To compare and switch Ameren electricity rates and plans, we have created a compare and switch tool, located on the right side of this page, for you to use. Simply enter your zip code and you will be able to compare electricity providers in your area, such as Constellation and Direct Energy.